This 9 hole course was constructed in the early part of this century and opened in June 2005. It has been designed to use all the clubs in your bag and will present a challenge to all levels of golfers. There is a burn which runs through the middle of the course and this has to be negotiated several times during your round. 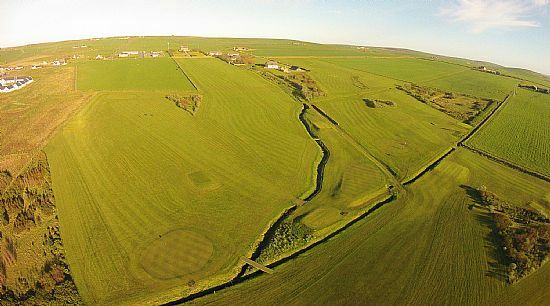 There are no par 5's on our course but we have some of the hardest par 4's on Orkney especially the long uphill 3rd and the 8th with it's island green. In the summer of 2014 we became an 18 tee, 9 hole course with a total length of 4914 yards and a par of 65. The Standard Scratch is 64. We have a changing room/locker room area with male and female toilets attached to our machinery shed. This is where the honesty box for the green fees is situated. Advanced bookings are not necessary, although it is best if large groups contact us in advance where possible, and the course is open all year weather and conditions permitting. With our course being situated so close to the village players have a choice of shops, pubs and a cafe where you can get refreshments. We also have a large putting green that visitors can use, for a small fee, if they are not planning to play golf.